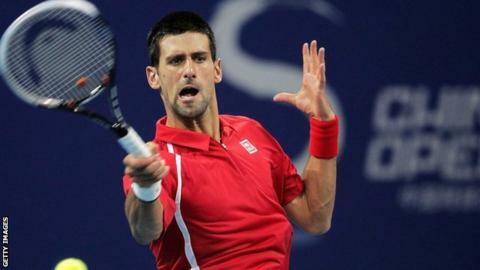 Number one seed Novak Djokovic has won the China Open, beating Jo-Wilfried Tsonga 7-6 (7-4) 6-2 in Beijing. The world number two lost just one set on his way to winning his fourth title of the year - his third China Open. In the women's event world number one Victoria Azarenka made easy work of Maria Sharapova to win 6-3 6-1. Sharapova was broken three times in the first set and offered little resistance in the second, unable to match the power and pace of Azarenka. Although the two are separated by just one place in the WTA rankings the gulf seemed enormous as Azarenka, 23, secured her fifth title of 2012. She won 68% of points on her first serve, 50% on her second and broke the Russian five times in total. The men's final was not quite as one sided though as Tsonga had chances against Djokovic. But he converted just one of six break points, while his opponent converted three during the match, which lasted just over one hour 40 minutes. It was the eighth time Djokovic has beaten the Frenchman.